The officer, who has not been identified, shot 21-year-old Emantic "EJ" Bradford, Jr. while responding to a shooting on Thanksgiving night at a mall in Hoover, Alabama. 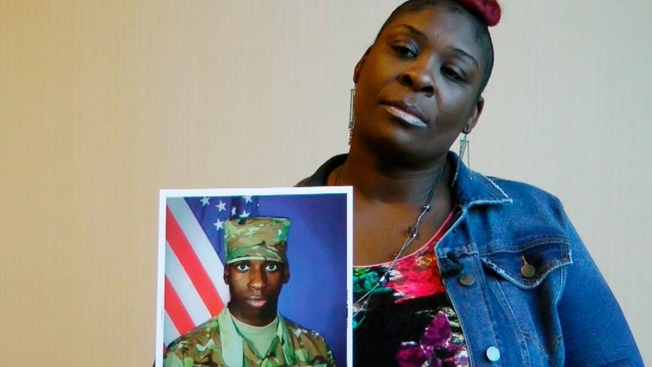 Bradford's mother said her son "was really the hero in all of this"
In this Nov. 27, 2018, file frame from video, April Pipkins holds a photograph of her deceased son, Emantic "EJ" Bradford Jr., during an interview in Birmingham, Ala.
An Alabama police officer will not face charges for killing a man he mistook for the gunman in a mall shooting, the state's attorney general announced Tuesday, drawing outrage from the slain man's family who said the officer jumped to conclusions when he saw a young black man with a gun. A 26-page investigation report released Tuesday by Attorney General Steve Marshall said the officer believed Bradford fired the earlier shots. But the report also said the Hoover officer, whose name has not been released, was still justified in shooting him because of the threat he posed. The report said the officer saw Bradford running toward the scene with a gun and believed he was trying to kill the shooting victim or harm others. The shooting victim was actually Bradford's friend, with whom he had been at the mall that evening.